When the Tunica Humane Society in Mississippi first opened its doors, it was a makeshift facility held together by a team of passionate volunteers with no funding. 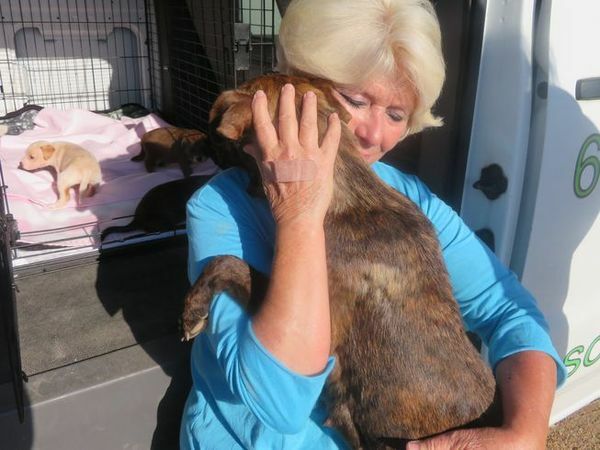 "Our shelter was very primitive, just a sea of dog pens with tarps flapping in the wind, but suddenly we were saving hundreds and hundreds of dogs," founder and director Sandy Williams tells MNN. Prior to the society opening in 2008, Williams says there were no provisions in the area to help homeless and abused animals. "Most of them met a certain death in our county, without ever having a chance at a loving home or much-needed medical care. We had no money, no resources, no support from our local government when we started, only the passionate desire to make a difference in the lives of these animals. Hard work and positive results is what fueled us in those early days." Williams took a chance and reached out to the foundation, thinking the Mississippi group might be a good fit with the foundation's mission. "A small grassroots charity. One that falls through the cracks on most grant requests and struggles with funding on a daily basis," she says. "We were small at that time, but our passion for the animals was unsurpassed." Williams sent the foundation a video showing the primitive shelter and the happy canine residents. Within weeks, the humane society received a check for $125,000 to purchase some land and a building so they could provide a real shelter for their animals with plenty of space for the dogs to play. Started in 2003, the New York-based Sidewalk Angels Foundation works as an umbrella organization, offering financial support and other resources to smaller groups that don't have the budget or organizational skills to expand their services. The group supports animal rescue organizations as well as other causes including childhood health and wellness and the fight against homelessness. The foundation's name was inspired by lyrics in Rob Thomas's holiday song, "New York City Christmas." In 2017, the foundation was honored with the Compassion in Action Award from the Humane Society of the United States "for making real change in helping those who have no voice." The foundation has raised more than $1 million and has helped groups such as Pets Alive, The Sato Project, Bully Breed Rescue, Equine Animal Rescue, The Animal House in Jamaica and, of course, the Tunica Humane Society. "Sidewalks Angels changed our world overnight," Tunica's Williams says. "When they took a chance and believed in a handful of volunteers in rural Mississippi, everyone else began to believe in us. The funding began to come easier from other foundations at that point." That was six years ago, and the relationship continues. Williams says the foundation sends two large donations every year and follows the humane society's work on social media. "Today the Tunica Humane Society is known across this country for the work we do with homeless and abused animals. We are a no-kill facility and have inspired other shelters in the South to follow suit," Williams says. "At the end of the day, we can only help as many animals as our funding allows. Because of Sidewalk Angels' continued support, we are able to save hundreds and hundreds of animals every year."